While you might not think about them often, the ducts in your home play a vital role in keeping the temperature consistent and the indoor air quality high. 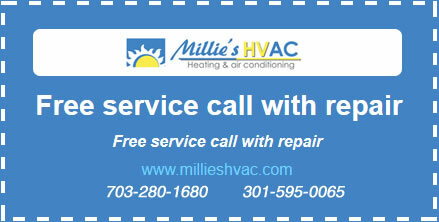 That is why Millie’s Heating & Air Conditioning is proud to offer comprehensive Great Falls duct repair services to customers all over the area. We want to make sure nothing compromises the comfort or safety of your home, and this is one of the best ways we can do that. Your home heating and cooling system relies on your ducts to get the heated or cooled air it produces into the living spaces of your home. These ducts form a carefully calibrated and pressurized system that facilitates smooth and efficient air flow with a minimal loss of energy. Your air ducts are also where your air filters and other indoor air quality systems are located, which means they have much to do with keeping your indoor air clean as well. So when something damages or compromises your ducts in any way, it will impact many systems in your home as well as your overall comfort level. Breaks or cracks in air ducts will change the flow of air through the entire system, often resulting in uneven cooling or heating throughout your home. And that kind of damage can also let all kinds of air pollutants into your home air circulation. Letting in outdoor air (and letting out indoor air) also compromises the energy efficiency of your home comfort system. It causes a loss of energy in the form of the outgoing air, and the air coming in then requires more energy to get it to the desired temperature. And that costs you money. For all of these reasons, it is best to call for professional Great Falls duct repair services from Millie’s as soon as you suspect you have a problem with your air ducts. Often symptoms that you attribute to malfunctions of your heating or cooling system are actually just problems in your air ducts that can be quickly addressed. These types of problems require professional attention, however, because so much of your air duct system is located inside walls, under floors and in other hard to reach places. Our technicians have access to all of the best diagnostic equipment and tools, so we can easily locate the source of the problem and make the necessary repairs. And because your ducts are so important, it is important to have a trusted professional complete the work, so you know it is done right. We are always available to answer your questions or schedule a service call; so no matter what type of problem you are having with your air ducts, do not hesitate to give Millie’s a call today.